I admit that I know very little about New Zealand. But until I read the Griffith Review’s 43rd, New Zealand-themed edition, (Pacific Highways, edited by Julianne Schultz and Lloyd Jones), I didn’t realise how much I didn’t know. I spent four days there once as a short stopover on my way to the US, but all that little taste gave me was a desire to go back and really explore the country in the time it deserves. Australia views New Zealand like a younger sibling to be picked on, and it is clear after reading Pacific Highways that the constant joking and stereotypes camouflage the real character of this country – a country which, unlike Australia, appears to know who it is and fiercely embraces that identity. I began reading Pacific Highways during the Sochi Olympics, while Roy and HG staged their Russian Revolution each night, covering the events and news of the games – as well as relentlessly making fun of New Zealand and New Zealanders. There seemed to be no reason for it apart from the fact that heckling New Zealanders is an accepted part of being Australian. But this time, I didn’t find myself laughing. The jokes were shallow and, really, not funny at all. It only proved what I’d suspected from the first half of Pacific Highways: that, despite its size and population, New Zealand is sure of itself as a country and more than capable of standing on its own two feet on the world stage. The edition begins with a beautiful essay, ‘To a neighbour I am getting to know’ by Chilean writer Roberto Onell, originally written in Spanish and translated into and published in English (the entire Spanish version can be found here). The essay reveals the writer’s love for the ocean, or, more specifically, for the Pacific Ocean, the vast body of water which connects New Zealand and Chile from different shores. Onell’s essay is a fitting introduction not only because it draws attention to New Zealand’s isolation at the bottom of the world, but because it is also written in a language other than English, it’s an acknowledgement to all the people who have come from abroad to call New Zealand home. 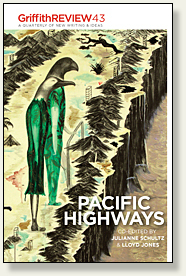 There are too many excellent pieces in Pacific Highways to mention them all, but the real achievement of this edition is that it exists at all. That the editors felt the need for an edition which celebrates New Zealand, explores its culture, showcases their writers and encapsulates the country’s identity. Australia may think it is the older sibling hovering over New Zealand, leading by example, but it’s well and truly time we acknowledged New Zealand for more than The Lord of the Rings movies, sheep and an accent which is great fun to impersonate. It seems to me that Australia is the country who could learn a lot by following New Zealand’s example. Reading the Griffith Review’s 43rd edition is a good place to start. This entry was posted in Arts, Books and tagged book reviews, lip lit, literary magazine. Bookmark the permalink.